Our 3 acre property is only a 20min. walk from Ganges. We nestled this clean and quaint cabin in its own cedar grove, separate from the main house. I have been renting our cabin for one year, and before that it had been used as a wellness studio and guest house. I enjoy my island life, and have been living on Salt Spring for 15 years. When I am not busy hosting, I can be found walking my dog in the back property which gives me access to the harbor. Our home was built by my husband who works as a full-time teacher. Bullock Creek Road is a collection of 3-acre homes tucked in a wooded pocket on the route from Long Harbor ferry terminal and only a 20 minute walk to Ganges. Our neighbors are friendly and quiet. We will greet you upon arrival, yet understand the value of complete privacy to come and go as you wish. If you need the scoop on the local happenings or just to be pointed in the right direction, I (a longtime islander) am happy to be your number one connection! Works best with mac products. Dishes for 2 including wine glasses, coffee mugs, cutlery, plates. Towels, kettle tea pot, filtered drinking water included. I'm sorry that I did not get to meet you, and I'm happy that you chose us for your special weekend! All the best to you. 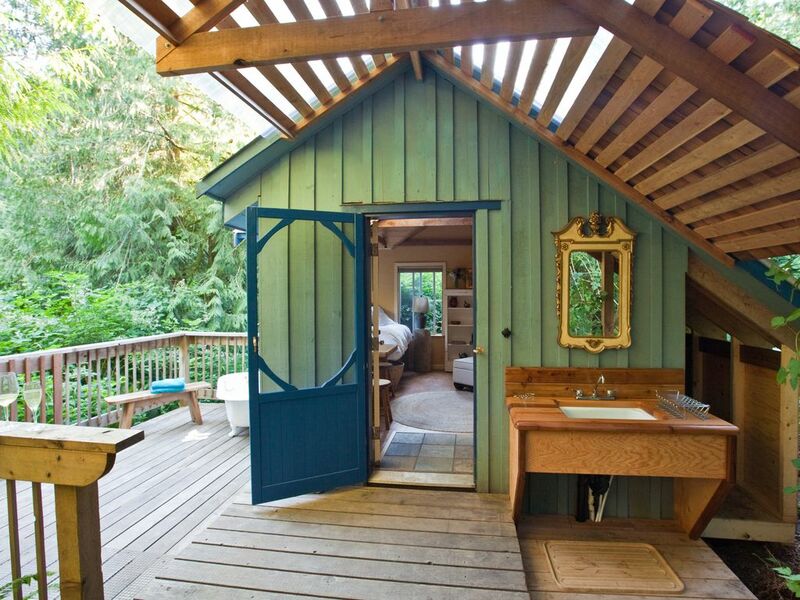 This is a charming and unique cabin where you can rejuvenate in the most peaceful forest setting imaginable. The cabin is spotless and really well maintained, there's a lot of love that goes into it. Tara is the perfect host, she is warm and charming, concerned for your comfort yet respectful of your space and an awesome cook, the breakfasts were wonderful. I brought my dog and she would give Westover a 5 bones rating for sure. I highly recommend the Westover experience and Aggie and I will return for sure. Thank you so much for the five bones rating! You and Aggie made hosting so easy and pleasant and I've thought about you many times since you left. Guests such as yourself are what I love about hosting so thank you again for coming and enhancing my experience too. Glamping at its best! Totally our kind of place to stay ~ rustic luxury, quiet, private, fabulous breakfast! We certainly plan to return. Thanks for the compliment, it was a pleasure to have you and your family. Your lifestyle choices and character are admired (and recommended)! Hope to see you again. Tara was a wonderful hostess and had great recommendations. Such a cute little cabin in the middle of the woods. Loved having the bath on the deck. Scrumptious breaky served by Tara the next morning - such a treat! Will be coming back again and again. p.
Magical little cottage in the Enchanted Forest! I had the most rejuvenating stay here! It's spotlessly clean and has great energy . You can feel that their has been many interesting people that have spent time in this little home away from home. Tara is by far the hostess with mostess....A truly beautiful soul! Puts in great effort to make your experience here memorable and special.Every small detail has been thought ....to the beautifully laundered linen,delicious home baking ,local products .Thankyou Martin and Tara for sharing! This Magical cottage is so sooo fun And sooo relaxing! Do not hesitate on booking here .... you will never be unhappy that you did! Already planning my next " Get Away" See you in the Fall! I meant it today when I said that my day had improved greatly since we talked this morning! You have a generous spirit and are at the very top of my guest list as far as favorites go. Thank you so much for deciding to come here, you are highly recommended to any hostess who will be lucky enough to have you! We loved our stay at Westover B&B. The cabin was just what we needed, private, cozy and comfortable. Thanks Tara for the tasty breakfasts and the welcoming hospitality. The tub on the deck was the perfect luxury after a day of exploring the island. We hope to be back soon. Thanks so much, Scott. It sure is easy to host when I have grateful guests such as yourself. It was a pleasure to meet you and your wife, I wish you all the best in life!